Radiology groups often ask these questions as they scramble to put together a plan for the 2017 Merit-based Incentive Payment System (MIPS) reporting year and prepare for 2018. Our practice includes both, diagnostic and interventional, radiology procedures. What does that mean for my reporting requirements? Am I a non-patient-facing or patient-facing clinician? What quality measures should we choose to report for 2017? No worries! We are going to cover the following questions here to ensure your radiology practice has the right formula for success. Let’s start with some MIPS background basics, know that in 2017 you may be subject to report on three categories of MIPS: Quality, Advancing Care Information (ACI), and Improvement Activities. In 2018, a fourth category will be added: cost. Each category makes up a percentages of your overall total composite score, the final score that will affect your Medicare Part B reimbursements in future years. What if I am a non-patient facing clinician? 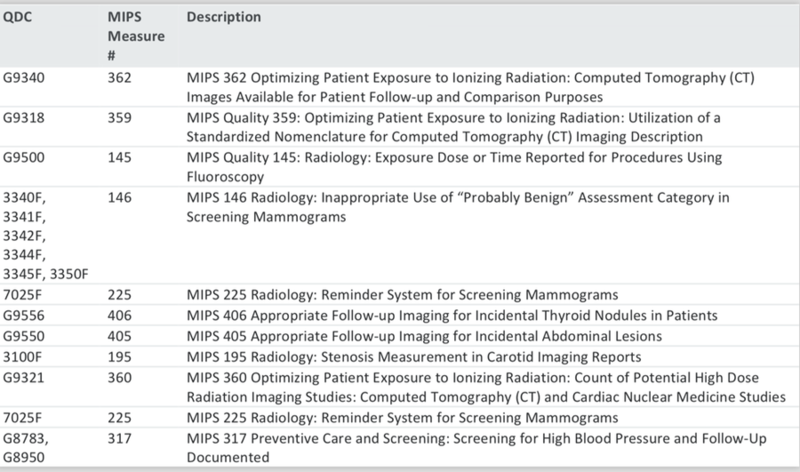 Which measures should my radiology practice choose?